Who here is an IKEA-phile? Ikeaphile, someone who is addicted to the low cost, modern Swedish world of Ikea, as defined by Urban Dictionary. With more than half of the Wedding Chicks office falling under this moniker, there is absolutely no Ikea shaming here. In fact, because we are a bit of Ikea enablers we put together some of our very favorite Ikea hacks found on Pinterest. So get your DIY boards ready, we have both some great Ikea ideas coming your way as well as the steps for creating all of these yourself! Wood You Like A Side Table? Stumped for side table ideas? What if you could give your modern home a little natural warmth? 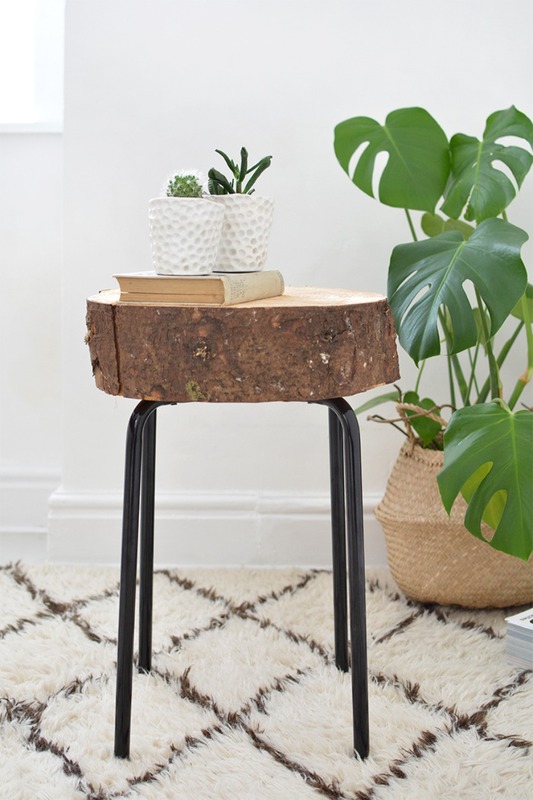 We love this insanely simple Ikea hack because not only is the Marius stool a steal but if you source your wood slice locally this DIY won’t take you longer than 10 mins to complete! You can find the full DIY instructions at BurkaTron. Okay, this is less of a specific Ikea hack and more of just a great pointer on how to hack all that laminated Ikea furniture that seems to have the superpower of repelling all paint. Hint it has to do with a magic (it’s not magic) primer! You can find the full tutorial at Designer Trapped. Ahhh the Rast dresser. 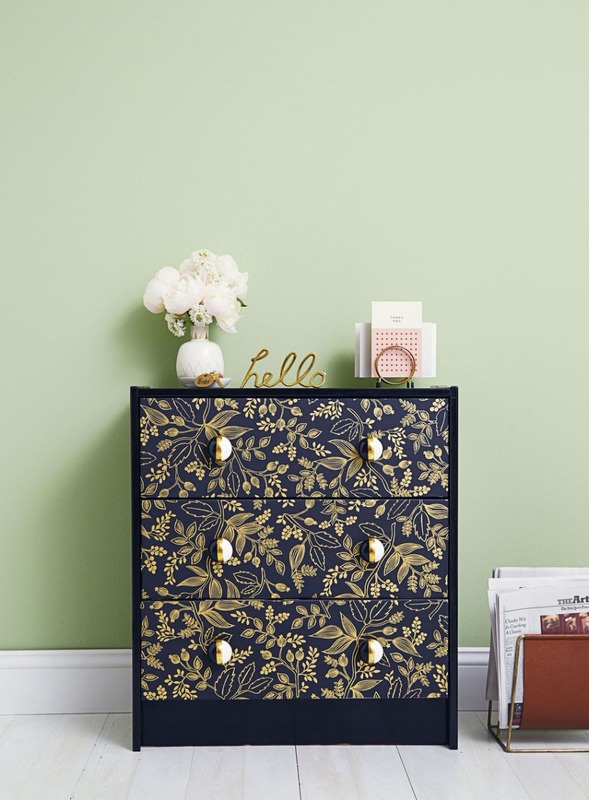 This Ikea classic has so many makeovers out there it’s hard to choose a favorite, but this Old Hollywood glam style that was hacked with a coat of paint and some wallpaper samples and new pulls is at the top of our list!!! You can find the exact paint, paper and pulls at Good Housekeeping, and if this isn’t your style be sure to check out the other nine Rast hacks there too! Have Chair? Just Add Rug! 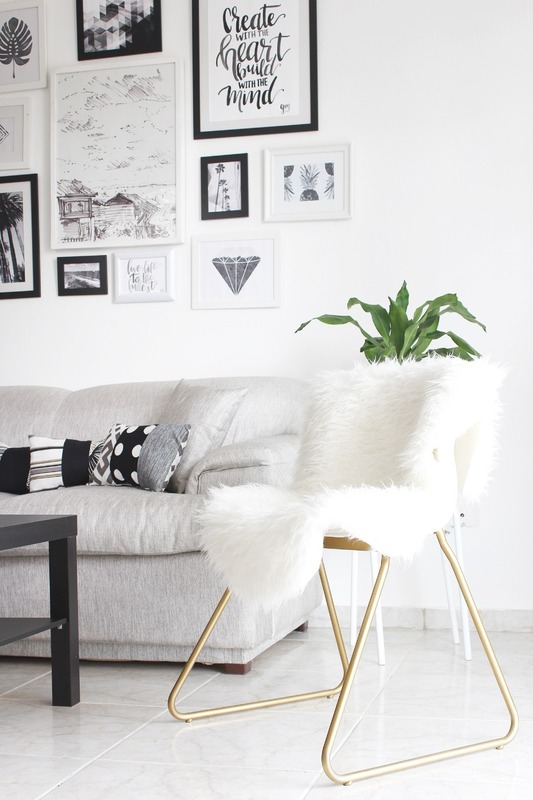 This fun and fuzzy little chair actually takes two Ikea pieces, the Bernhard chair, and the Rens sheepskin, and a little gold spray paint to create this oh-so-chic seat. So to glam up your living room head on over to The Key Item for a full DIY. Looking for a little cotton candy pastel fun for your floor? Give that Ikea Rens sheepskin a dye job! We had no idea this was even possible with faux fur, but the wonderfully talented Paper and Stitch show us just how to dye any synthetic material you want. So don’t just stop at the sheepskin, the world of synthetic material is your dip-dyed oyster! This Ikea hack doesn’t even look Ikea anymore! 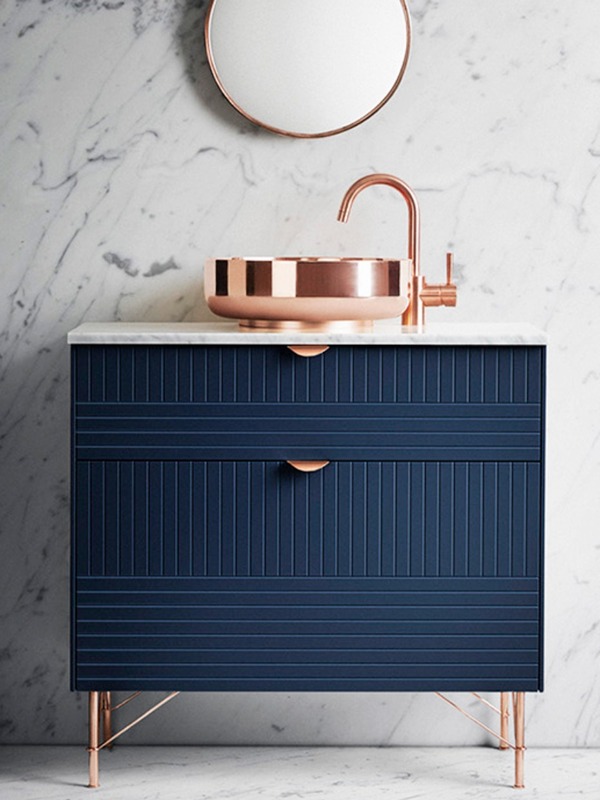 With that modern design on the cabinet doors and those cute peg legs, we’d expect to find this at West Elm for sure! Want to turn your Ivar cabinets into something like this? Check out Paulsvera for the full DIY! That Pouf, That Pouf, That Pooooouf! As pouf owners and lovers ourselves, learning how to cut the cost of this little obsession is most welcome! But be warned, this little Ikea hack requires some sewing knowledge. 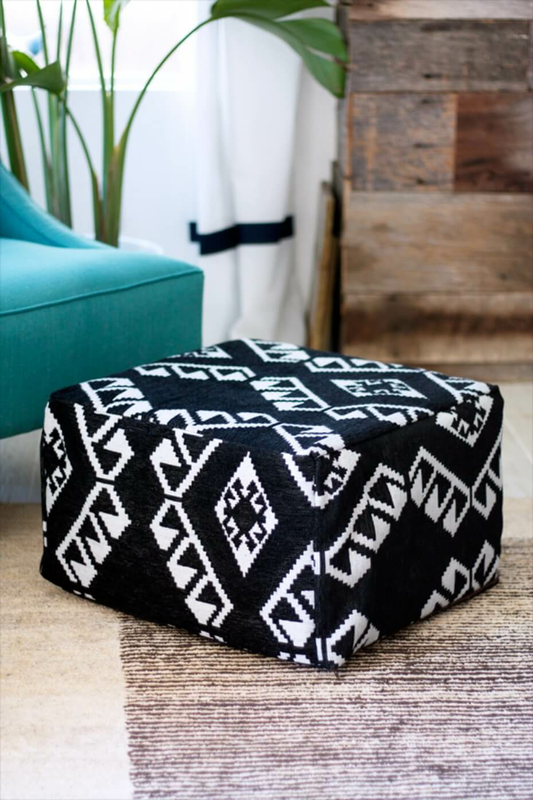 But hey if you can turn your Nils footstool into a cute little Navajo print pouf, it might just be worth it to make friends with a sewing enthusiast or at least have them teach you. Find the full DIY and pouf pattern on Kristi Murphy’s blog! Window treatments are stupidly expensive, so if you can find a way to hack that price out of your life count yourself lucky. … and today is your lucky day! My Sister’s Suitcase has taken the drab out of the Vivian curtains from Ikea and turned them into some very enviable modern window accessories that we cannot wait to do ourselves! 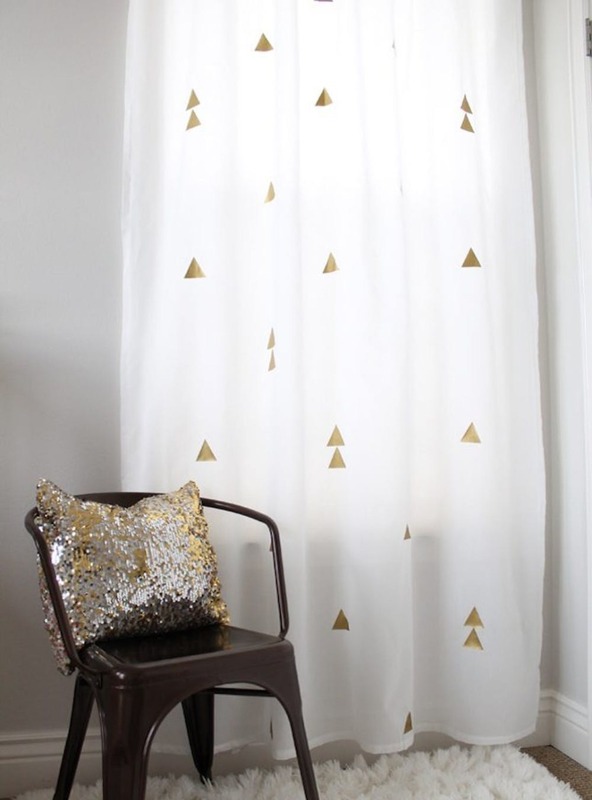 So check out these gold triangle curtains and two other curtain DIYs on at My Sister’s Suitcase. This Ikea Hack has to be a Mirror-age! Ummmmm, wait, this is a hack for Ikea?! No way! … but yes, yes it totally is. 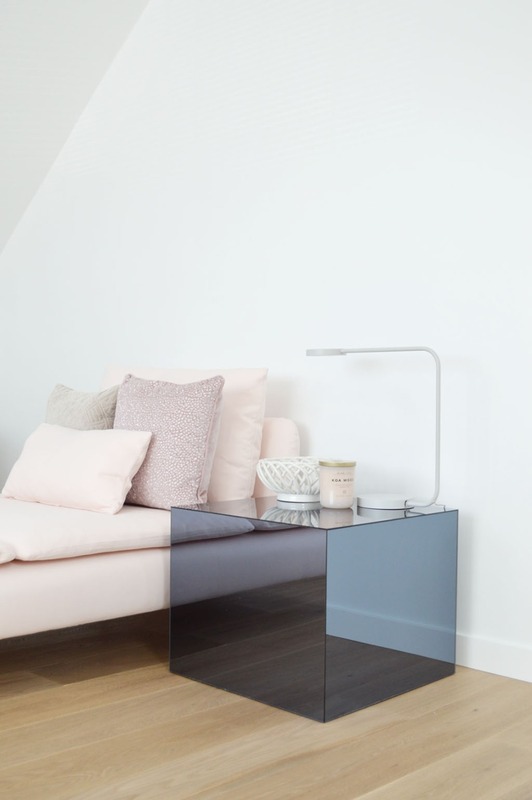 That plain little Lack side table got one heck of a makeover from Ich Designer! Mirrored plexiglass sure does make a huge difference, our jaws are still on the floor. You can find the full DIY at Ich Designer. How To Hack The Ikea Hack! Looking to hack your Ikea furniture without all the hassle? Not really on a budget? Are you living in select countries in Northern Europe? We have a tempting DIY cheat for you! For anyone in Sweden, Finland, Norway, Denmark, the Netherlands, Belgium, France, Germany and the United Kingdom you should really give SuperFront a look. This company makes fronts, pulls and legs for all of your favorite Ikea furniture. That’s right, this means no trips to the home improvement store, no worrying about paint drips or messes, just order your preferred new look in the color you like and all your new parts will arrive in the mail! Sorry US and anyone outside of the above countries, we’ll just have to keep Ikea hacking the old-fashioned way. 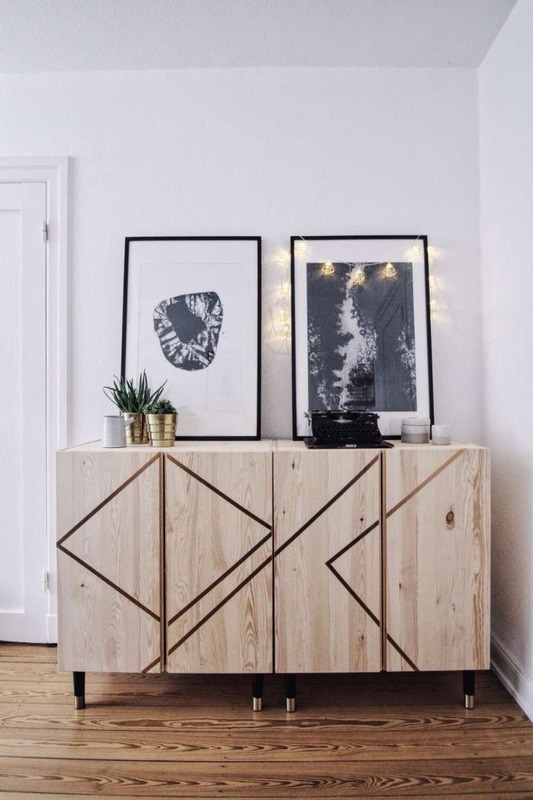 *Note: SuperFront does ship their furniture legs and pulls worldwide, so between that and their inspiration galleries you should definitely go snag a few rad ideas for your home Pinterest board.